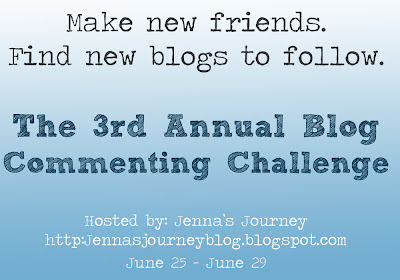 Jenna Blogs: The 3rd Annual Commenting Challenge Begins NOW! Welcome to Day 1 of the 3rd Annual Blog Commenting Challenge! If you're new this year, a big welcome to you! If you've participated in the last two challenges, welcome back! This year, I'm doing things just a little differently. The challenge will only last for 5 days instead of 7. In the past, I've asked that you pick 10 blogs to comment on each day...and I got a ton of mixed feedback. Some people wanted to do more, and some had trouble commenting on 10 per day. This year, I'm still setting the goal at 10 per day, BUT if you can do more then please do! If you can't do 10, just do however many you can manage. This is meant to be a fun, getting to know you type experience. One more change for this year. I've had a lot of people email me over the last two years asking if I could provide topics for each day because they were having trouble coming up with something to blog about for each day of the challenge. This year I will provide a topic for each day. Just check in with me at 8am central time each day to view the topic. Then, if you'd like, you can blog on that topic. This is not required - it's just to help anyone who is having trouble coming up with something to say. So, let's get this challenge started! ~ Link your blog's main page on the linky. ~ Link back to this blog post. ~ Write a blogpost for each day of the challenge. Remember, I'll be providing a topic each day, so if you don't have something already written, just use my prompt. It will be posted at 8am each morning, so visit me here and then write your post! ~ If you find a blogger you love, add them to your blogroll! Tell us about YOU! What's your name? Where do you live? Who lives with you? Do you work outside the home? Have kids? Pets? (Psst! Don't spill the beans about your blog or hobbies quite yet!). If you haven't visited my blog before, then hi! I'm Jenna! I live with my husband Chris and two boys, Brayden & Brody in Arkansas. I'm a Southern transplant from California. We have two golden retrievers named Mossy and Buster. I haven't worked outside of the home in many years, but before I quit working to stay at home with my kids, I was a clothing designer for Wal-Mart. 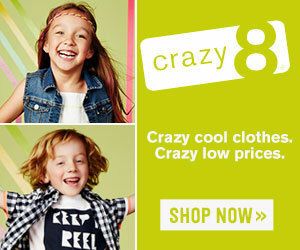 I designed newborn - big girl/boy clothes for one of our in-house brands. My husband and I got married in October of 2005, and after several years of infertility and a miscarriage we had our oldest, Brayden. He was very, very ill when he was born. He was full-term and we didn't expect there to be any problems, but his pulse oxygen level was down into the 40's at one point. He ended up spending 5 weeks at Arkansas Children's Hospital. If you want, you can click here to see his old hospital posts. I like to look back sometimes and see just how far we've come! Brody was born 22 months later. I love having our boys close in age - they are the best of friends. It is such a joy to watch them play and interact with one another. They are both happy, healthy, wonderful kids! I love being a stay at home mom and taking care of my kids everyday!